I Love Okra! 3 Vegan Recipes. I'll admit that one of my votes for my "most feared veggie" had to go to okra. But silly me, I had never even cooked or eaten it! Okraphobia. Maybe it's the word okra, maybe it's the absence of an okra aroma, maybe it's the pointed reptilian-like shape, or maybe it's those scary round slimy seeds that ooze out of the okra flesh. Okra made me cringe. But I successfully dreamed up three yummy recipes that will turn the haters into lovers. Including me....And it doesn't hurt that okra is so healthy. I Love Okra. 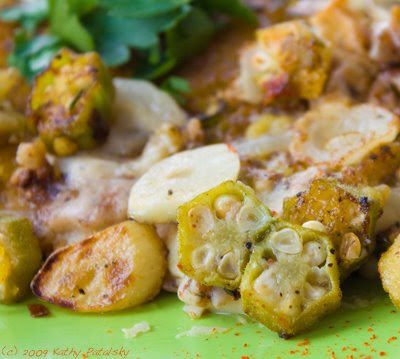 Here are three delicious recipes using okra. I'm an okra convert! The Peanut (Okra-lovers) Gallery. 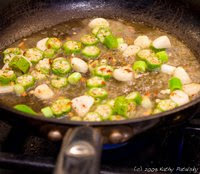 Luckily, I received a lot of great ideas from my blog-readers about their favorite ways to prepare okra: okra gumbo, deep fried okra, boiled okra, stewed okra and tomatoes and even okra casserole. But fried okra was the most popular method. Go figure. Not exactly a healthy cooking method, but I kept an open mind. I decided to listen to the okra-experts and do a skillet recipe, as well as a salad with some SoyBoy brand Okra Burgers I found at Whole Foods Market. And even a cornbread recipe for a sweet side. My feat proved successful, and I'm happy with the results. And FYI, please feel free to modify the ingredients to suite your dietary needs. Prep: thinly slice okra, discard stems. thinly slice scallions. Slice onions into thin rounds. 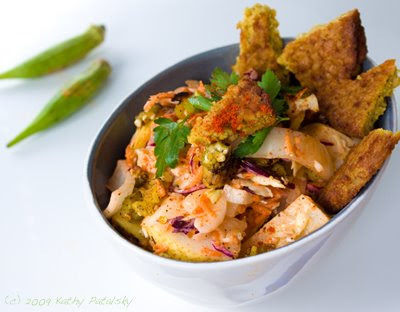 Veggies: Combine okra, scallions, garlic, 4 Tbsp lemon juice. red pepper, 1 tsp salt, 1 tsp black pepper and 1 Tsp maple syrup. Mix well. Allow a few minutes to marinate. Mayo: Mix ingredients for maple mayo together. Store in fridge until ready for use. Batter: Corn Flour, canola oil, soy milk, 1 Tbsp maple syrup. In a hot frying pan, add butter- about 2 tsp per cake. You can also use more or less according to your taste and frying skills. 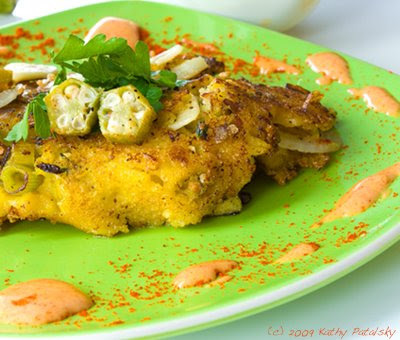 When surface is hot, add veggies for one cake serving. About 3-4 Tbsp uncooked. Saute on high until edges begin to brown. Push veggies to center of pan to form a loose circle. Add batter to pan for one cake. Pour evenly over veggies. Turn pan to spread batter evenly over veggies. Allow to cook for 2-3 minutes, until edges brown, bubble and crisp. Add cheese and sliced Vidalia onions - and any additional filling. Fold over cake and flip as needed to cook to your desired crispness. Cake will be delicate so flip with care. Repeat for each additional corn cake. Garnish plate with parsley, fresh herbs, paprika and mayo drizzle. 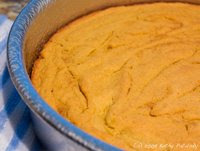 Version#1: Prepare the cornbread with no okra in the batter. Then add a garnish of Okra Syrup: recipe below. 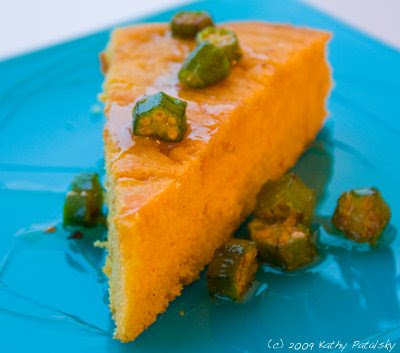 Version #2: Below, prepare the cornbread with okra in the batter. 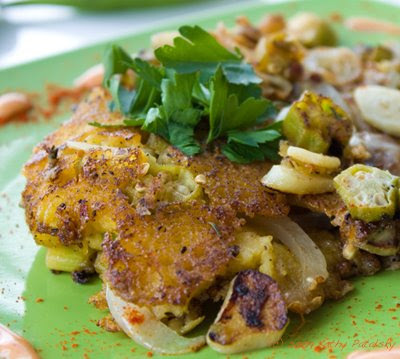 *You can also add garlic, onion, shallots, bell pepper or corn to this veggie saute. Add flour, baking powder, salt and cayenne. Pour into 8 inch circle baking pan. Top with a drizzle on agave syrup and swirl into batter. Add a few okra slices to top of bread for garnish. Serve with honey butter or a nice spicy sweet jam. 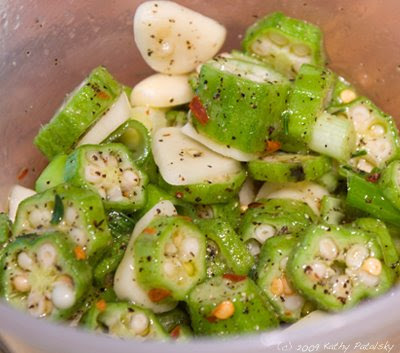 Version #1: If doing the first version, garnish with this recipe for Okra Syrup. 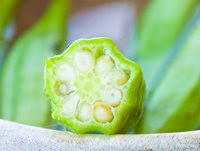 Okra is great for jams and syrups because its natural stickiness makes a crazy sticky drizzle reminiscent of honey. Heat all ingredients on high for 4 minutes. Allow to slightly cool before drizzle-ready. saute on high for 2-3 minutes. 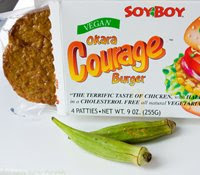 Okra burger: heat in microwave for 45 seconds, or saute in skillet. Slice into small triangle pieces. Pour slaw into bowl. Top with hot okra saute. Top with triangles of Okra burger. Wow! That's a lot of okra! 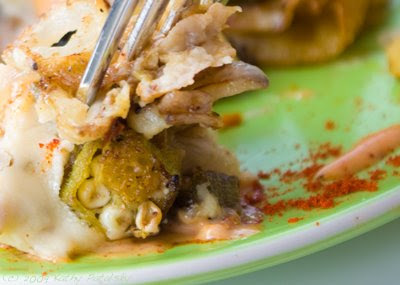 I hope one of these recipes makes you learn to love okra just as much as i do not. ...now eventually I have to work on some I love eggplant recipes. That's going to be tough!